Nearly 90 high school basketball players around the state came to the Renaissance Hotel in Woodbridge to celebrate a fantastic 2018-19 season. 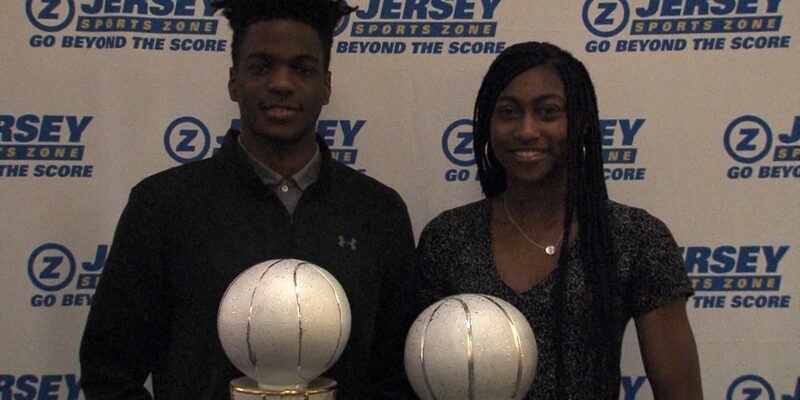 Ranney’s Bryan Antoine is JSZ’s 2019 Mister Hoop Zone and Franklin’s Diamond Miller is Miss Hoop Zone 2019. Jersey Sports Zone thanks everyone for attending from every part of the state! Before the players, coaches and family sat down for dinner and watch our videos, JSZ’s Nery Rodriguez and Madison Bess were in our social media zone talking with the honorees and getting the festivities started. With a podium featuring three McDonald’s All-Americans, Ranney’s Bryan Antoine won the vote among coaches and statewide media. The Villanova signee closed out his high school career as the Shore Conference’s all-time leading scorer with over 2,500 points and teamed with fellow finalist Scottie Lewis to lead the Panthers first ever Tournament of Champions title. Antoine won the vote over Lewis, the Roselle Catholic duo of Kahlil Whitney and Josh Pierre-Louis and Gill St. Bernard’s Paul Mulcahy, who’s on his way to Rutgers. Franklin guard Diamond Miller had a perfect season and a perfect ending to her high school career when she won JSZ’s 2019 Miss Hoop Zone. The McDonald’s All-American will represent New Jersey in the national showcase in Atlanta. Miller is signed with the University of Maryland. Future teammate Faith Masonius of Manasquan was a fellow finalist along with Saddle River Day’s Michelle Sidor (Michigan), Gloucester Catholic’s Azana Baines (Duke) and Manchester’s Leilani Correa (West Virginia). Emma Duerr Morris Catholic Kemari Reynolds Manchester Twp. Thanks to everyone who voted for our JSZ Plays of the Year. Hudson Catholic’s Shane Dezonie won Dunk of the Year and Red Bank Catholic’s MJ Wright won clutch play of the year for his buzzer beater against Marlboro at the WOBM Christmas Classic.